You exfoliate your face, but what about your body? Yes, you read that right. Just as you need to slough away dead skin on your face to keep it from looking dull and dry, you should also exfoliate your body to keep the skin healthy and radiant. So how exactly do you exfoliate your body? Can you exfoliate dry skin? What products are best for body exfoliation? Below, we break down everything you need to know! Why should you exfoliate your body? We use the Dove Exfoliating Body Polish because the exfoliating beads remove dull, dry skin, deeply nourishing the skin to restore the skin’s natural nutrients and leaving it baby-bottom soft. Plus, it helps products (from lotions to body butter) penetrate even deeper into the skin. How do you exfoliate your body? First things first, you should exfoliate from the neck down — but do it gently! Also, as you would with any new skin care product, incorporate the body polish into your routine slowly. We recommend using it once a week then gradually upping the usage to three to four times per week. Be sure to consult your dermatologist with any additional questions. Can I exfoliate if I have dry skin? Yes, you can exfoliate dry skin. In fact, it’s highly recommended as dead skin cells can block water from fully absorbing into the skin. 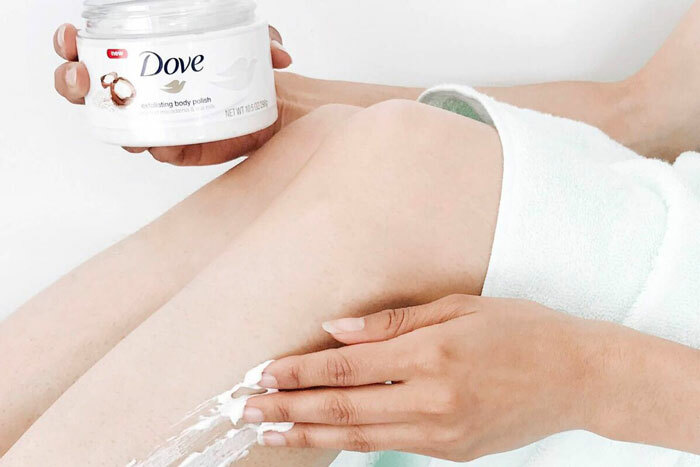 If you’re still worried about feeling dry, you should know that the Dove body polish exfoliates and nourishes (it’s made with 1/4 moisturizing cream!). And the deliciously whipped texture is definitely a plus! Just make sure not to over-exfoliate as it can cause additional dryness. Should you exfoliate with hot water? We love hot, steamy showers as much as the next gal — but you should know that it can actually strip the skin of its natural oils, leaving it dry and sensitive. Stick to warm water instead!